Gem experts differ on the degree of green that makes one stone an emerald and another stone a less-expensive green beryl. 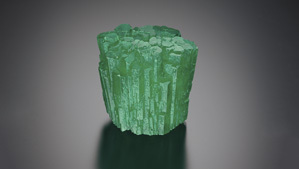 Most gemmologists, gemmological laboratories and coloured stone dealers call a stone green beryl when its colour is “too light” for it to be classified as emerald. Even among that group, however, there’s a difference of opinion about what’s considered “too light”. 2011 sales price for Elizabeth Taylor’s emerald pendant – a record $280,000 per carat. Three-phase inclusions in Colombian emeralds contain tiny crystals of rock salt, liquid and a bubble of gas. Emerald has been the standard for green coloured stones for millennia. The most desirable emerald colours are bluish green to pure green, with vivid colour saturation. In Emerald expect to see inclusions that dealers like to call an internal “jardin”, or garden.